The National Hurricane Center in Miami expects that Dorian, moving west at 22 m.p.h., will weaken to 'tropical depression' status before passing over the eastern tip of Cuba. The NOAA satellite image taken Friday at 10:45 a.m. EDT shows fair weather with partly cloudy skies over much of the Caribbean. 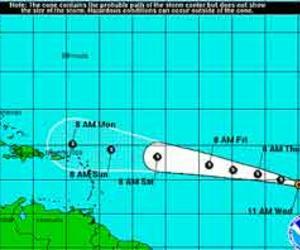 Tropical storm Dorian is gradually losing steam in the central Atlantic Ocean, with the storm expected to weaken to a tropical depression by Sunday afternoon, according to the latest forecast from the National Hurricane Center in Miami. As of 5 p.m., Eastern time Friday, Dorian was centered some 1,300 miles east of Puerto Rico, sporting maximum sustained winds of 45 miles an hour. The storm is moving west at 22 miles an hour. Earlier Friday, forecasters noted that Dorian was becoming less organized and would encounter drier air and wind shear, which weaken tropical cyclones. Those conditions now seems to be exerting their influence on the storm. Although the official forecast has the storm weakening to the point of dissipation by next Wednesday, forecasters suggested Friday afternoon that if the current weakening trend continues, the storm could be demoted to a tropical-wave status – one notch below a tropical depression – much earlier. Large uncertainties are attached to five-day track forecasts. Still, the best estimate for Dorian's path through Tuesday has shifted a bit south compared with the previous forecast. The slight tweak to the track, however, still brings the system as a tropical depression along the north coast of Hispanola and over the eastern tip of Cuba. Dorian emerged Wednesday from a tropical depression located over the eastern tropical Atlantic, just in time to become the first Atlantic tropical cyclone to be tracked by a pair of new supercomputers and significantly upgraded hurricane-forecasting software. The new supercomputers, one based in Reston, Va., and the other in Orlando, Fla., represent a threefold increase over the hardware they replace in the number of calculations they can perform each second.